ZACATECAS, MEXICO – Nothing about the state of Zacatecas’ historic capital is ordinary. From the varied architecture of its pink stone buildings to its winding roads that climb up the craggy Brittany Hills, to the majestic beauty of its baroque cathedral, the city’s sights go beyond expectations to stir the imagination. Even something as practical and familiar as a downtown vehicle bridge in this UNESCO designated “World Heritage City” takes on a special aura thanks, to a collection of ILUMILINE and ILUMIPANEL color changing fixtures from Chauvet’s Iluminarc division. An imposing 300-meter (985-foot) elevated roadway that runs through the city’s downtown, the recently completed bridge has quickly become a familiar landmark to Zacatecas residents. Wanting to convert the bridge into an aesthetically pleasing structure that blends with its surroundings, the Zacatecas State Government turned to Iluminacion Versatil S.A. de C.V., from Xalapa, Veracruz and lighting designer/project supervisor Luis Amaro. Working quickly over a five-day period, Amaro and his team of 15 technicians installed 58 ILUMILINE 36 IP linear RGB wash fixtures and 6 ILUMIPANEL 40 IP panel washes equipped with 40 3-watt RGB LEDs and 30° lenses. The linear ILUMILINE 36s were positioned on both sides of the bases of 10 large Y-shaped structural supports; while the panels were used to uplight wall areas. 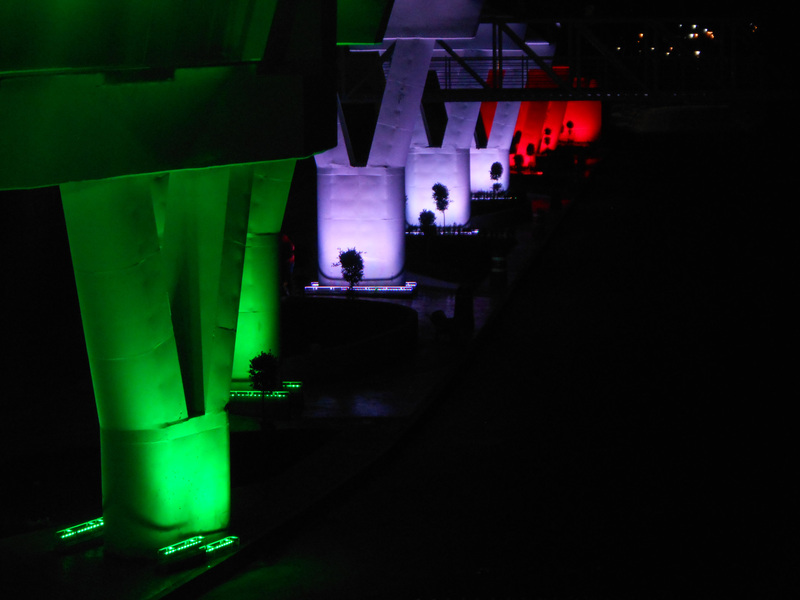 The bridge’s gleaming white support columns, which are set at different angles to the road overhead, provide an ideal backdrop for the colorful light from the Iluminarc fixtures. With their gleaming white surfaces, the spacious support structures also reflect the LED fixtures’ colored light back brilliantly. Brilliant, too, is the choice of colors that Amaro selected for the bridge display, some of which appear almost translucent when reflected against the white columns at dusk. There are cool limes, soft lavenders, bold reds and many more vivid hues, giving the bridge the appearance of a tropical concrete garden. The colorful display has moved the bridge beyond a utilitarian necessity and woven it into the fabric of the city’s cultural life. This is evidenced by the way the bridge changes colors to reflect holidays like Christmas, Independence Day and New Year’s Eve as well as commemorative occasions to support causes like Autism Awareness and Breast Cancer Prevention. Controlled by a CHAUVET DJ XPRESS remote control and XPRESS 512 PLUS interface along with a CHAUVET Professional Data Stream 4 splitter, the lighting display is automatically turned on every day a 6 pm and goes off every morning at 2 am. During this 8-hour period each day, the lighted display brings pleasure to countless Zacatecas residents and visitors, reminding all who admire it that this venerable city, which was founded in 1548, remains dedicated to maintaining a good balance between functionality and beauty.